A writer in Germany takes in the Brose Baskets Bamberg v. Alba Berlin championship game and reflects on what Dirk Nowitzki means to his countrymen. At the final game of the German basketball championships in Bamberg on Saturday, screams and noisemakers and applause blend together in a terrible roar, focused and directed by the corps of drummers behind the home basket. Don’t think marching band. Think Roman galley. Think ancient war drums. It’s still 45 minutes until tip-off and the place is barely half-full. Welcome to the capital of Germany’s basketball nation. 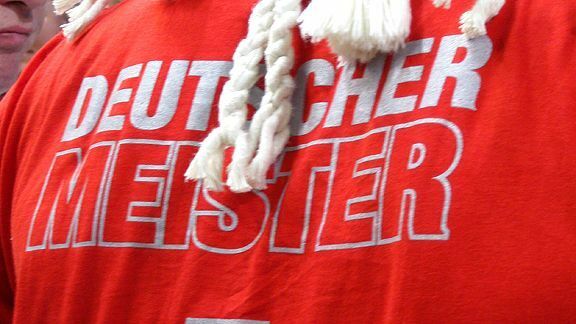 The official name of the Bamberg basketball stadium is the Stechert Arena, but most everyone calls it the Frankenhölle: The Hell of Franconia. Hell for visiting teams, teams like tonight’s visitors, Alba Berlin, who are deluded enough to believe that they can win here. This season Brose Baskets Bamberg has gone undefeated at home through the entire regular season and playoffs, carried not only by talent but by the intensity of their fans. Walter Schell’s face is painted a spooky, glaring white. Bright-red flames climb from his neck onto his face, licking upward as high as his temples, as others shoot down his forehead. Red Christmas-tree lights blink in his red-dyed hair. There are devil’s horns attached to his visor. His jersey has his nom de guerre on the back: “Evil Little Brose” and the number 666 on the front. He is 57 years old. He is one of the drummers tormenting my eardrums. “It will be very loud tonight,” he shouts over the other drummers. As if on cue, high-school-age kids with brass instruments file into the section as well. “Very.” He bought expensive carbon-fiber drumsticks for the final tonight, he tells me excitedly. He plays so hard he often breaks his sticks during games. I smile and nod, wondering if I could maybe steal them, hide them, anything to silence them. It may seem loud now, he warns me, but I better watch out if the native Bamberger Sven Schultze takes the floor. The six-foot-nine enforcer is suiting up for the wrong team, in Berlin blue and yellow. This is one place that does not take kindly to traitors. Soccer may come first in Germany but the historic region of Franconia has been crazed about basketball since American soldiers stationed here after World War II ushered the sport from obscurity to prominence. That is truer now than ever before. Bamberg vies for back-to-back championships and Franconia’s native son Dirk Nowitzki and his Dallas Mavericks have just won the NBA title. Nowitzki grew up just an hour west of here in Würzburg. He held his legendary training sessions with mentor Holger Geschwindner in the little town of Rattelsdorf, a 20-minute drive north past Kemmern and Breitengüßbach. There he perfected the high release for the shot that scorched the Lakers, the Heat and every other team the Mavs faced in the postseason. The Frankenhölle could well have ended up his home court if he had not put in the thousands of hours of work, or if he had given up after his brutal rookie season with the Mavs. Some say, if there’s a lockout in the NBA, he may yet hear the German national anthem before each game. Dirk has played plenty of games on the hardwood here. The national team regularly bypasses much larger arenas for the home-court advantage the crowd gives them in Bamberg, guys like number 666. It has been a grueling couple weeks for those fans. The club from Berlin has pushed their squad to this deciding game five in this best-of-five championship series. 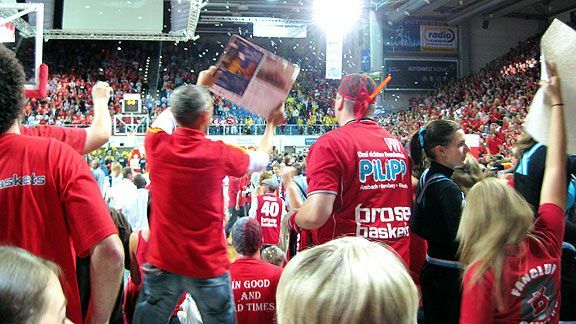 At the same time, the Bamberg faithful were pulling all-nighters to watch Dirk seize his first championship. The games in Dallas and Miami often ended around 6 o’clock in the morning here, sending unshaven fans to the office or the factory floor with beer on their breath and no sleep. It’s probably not what the auto-parts supplier Brose, with its facility on the outskirts of town, was thinking when they decided to sponsor a basketball team. The convoy of six double-decker charter buses and about 50 cars gathered in the parking lot at the O2 Arena, which looks out from the former East Berlin neighborhood of Friedrichshain and across the River Spree into the West Berlin neighborhood of Kreuzberg. The fiftieth anniversary of the Berlin Wall will be commemorated this August, but more than two decades after it fell in 1989, the differences between the sides have begun to blur. The caravan crosses invisible borders between East Berlin and West Berlin, and several hours later from the former East Germany into the former West Germany on an overpass with an optimistic sign declaring it the Bridge of German Unity. Germany is one country again, but the Alba Berlin fans are entering hostile territory. Nearly 700 Berliners make the journey, an invading army in bright yellow, hoping to dull the home-court advantage. Unlike bombed-out, post-Communist, wall-scarred Berlin, Bamberg is among the most striking medieval towns to survive the World War II air raids. Its colorful stone and timber-framed houses, its Romanesque cathedral with four high towers and its centuries-old breweries conjure up a fairytale Germany, a Disney Germany even. The town sits near Dirk’s birthplace of Würzburg, but is also not far from the composer Wagner’s temple to his vision of opera in Bayreuth and the site of the Nazi rally grounds in Nuremberg. The concentration of American soldiers in places like Würzburg, Schweinfurt and Bamberg was no accident. Franconia was on the frontline of the Cold War and the Americans waited with their tanks to fight World War III here against the Soviets. Wolfgang Heyder, general manager of Brose Baskets Bamberg remembers being “infected with the basketball bug” when he was just a boy and the games were still played at the John F. Kennedy Hall on the local military base and spectators still smoked in the stands. He watched in awe as the American star Jim Wade traded baskets with the captain of the German national team, Holger Geschwindner, who now lives nearby. In a long career as a youth basketball coach, Heyder had the chance to tutor Geschwindner’s star pupil on several regional all-star teams. His pride in Nowitzki’s success on the court is obvious, but the canny businessman who has built a championship team cannot help but see the missed chances in branding, marketing and merchandising. “Dirk is so humble it was never that important to him,” explains Heyder, a fit, trim man with his hair buzzed close. “He could have done so much more.” Bamberg is doing its little part, selling Dirk bobbleheads starting today. Nowitzki always picks up the key to the gym at the same bakery in Rattelsdorf before his practices with Geschwindner. While he is there he gets these very German pastries called Quarktaschen, or pockets of dough with curd cheese in them. Or so I keep hearing. I have no idea if it’s true and the fact is it doesn’t matter if the story is true or not. What matters is Germans believe that Dirk is the kind of guy who gets the Quarktaschen and is extremely friendly and polite and even shy talking to the people behind the counter. Handball is a sport something like soccer with your hands or lacrosse without a stick, but it mostly just seems fake, like a screenwriter was forced to invent a sport for a movie set in the future. Nowitzki’s reputation here in Germany is startlingly similar to what it is in the States. The word you hear the most often is “bodenständig,”2 or down to earth, feet on the ground, a funny compliment for a star in a sport where one of the baseline measures of worth is the vertical leap. Six-foot flames shoot into the air as the announcer at the Frankenhölle calls out the Bamberg players’ first names. The crowd roars each player’s last name in response. The pyrotechnics light up seas of spectators uniformly dressed in red and white. One woman, shirtless except for a white bikini top, is painted white with red tiger stripes. No one bats an eye as she walks by. 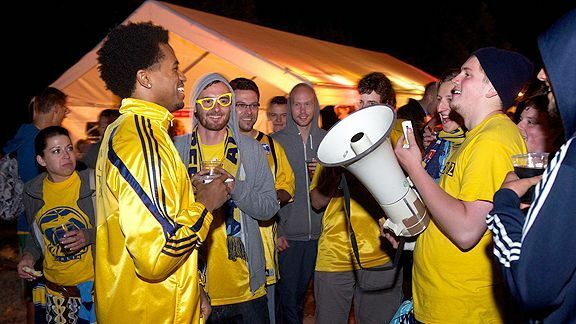 I try to make conversation with a group of fans in Alba yellow. They confess that they are Bamberg supporters so desperate for tickets they pretended they were from Berlin to get seats in the visitor’s block. My ears are throbbing when the game begins. The warm feeling and the tickling sensation has me wondering if they really could begin to bleed. I was at Game Four in Berlin and it was loud and intense but I never felt anything approaching this disorientation. I am overwhelmed. Alba Berlin is not. The game tips off. They score the first two buckets of the game. The Berlin team started the year poorly. Earlier in the season, they lost a game in Bamberg by the incomprehensible score of 103 to 52. That was unacceptable for a club with a championship pedigree. Their coach was fired, the team overhauled and a remarkable comeback began. Casey Jacobsen nails three shots for Brose Baskets in the first quarter, two of them threes and Bamberg takes the lead back. The former first-round pick played for the Suns, the Hornets and the Grizzlies but says there is nowhere in the NBA as loud as the Hell of Franconia. Jacobsen, who is beloved in Bamberg after winning the finals MVP in 2007, is the exception to the rule when it comes to Americans. The most successful players seem to be not the more heralded talents with the most experience in the League, but those who are happy to be making a living playing basketball and committing to their teams. One such player is Julius Jenkins, who played for Georgia Southern and has been in Europe since leaving college in 2003. He has been with Alba since 2006 and is a favorite with the fans in the bright yellow shirts bouncing beneath the away basket. Jenkins is easy to follow on the court with his long dreadlocks pulled back into a ponytail. He takes over the game for Alba in the first half, scoring 16 points despite the fact that he has come off the bench. Nothing is coming easy on the court. Players are fighting through picks like fullbacks hitting the line of scrimmage. At one point four players are on the floor after one loose ball. The first half ends with Alba up one, 30 to 29. Bamberg is getting nervous; 103 to 52 is a distant memory. True German basketball fans are a little like American soccer fans, a very dedicated minority with a chip on their shoulder. They grew up setting their alarms for 3 o’clock in the morning, watching alone as Jordan juked Bryon Russell or Shaq overwhelmed Iverson’s Sixers. My friend Christoph Niemann is known to an American reading public as the illustrator of whimsical drawings for The New York Times and The New Yorker. He also has a past as a serious basketball player in his hometown of Ludwigsburg near Stuttgart and played in the German equivalent of the Elite Eight in the ’80s. He describes how as a kid the only way he could see basketball, his favorite sport, was to watch a Sunday highlight montage that showcased fencing, volleyball and obscure equestrian sports like dressage and steeplechase.3 This was before the Internet, before most people had VCRs. He would sit in front of the television for the entire two hours every week even though he didn’t know whether or not they would show highlights from the NBA. “I would watch two hours of the most boring sports in the world just in the hopes that I could see three minutes of basketball,” he reminisced over a beer. “Tons of gymnastics,” he said with a shudder. “I hated gymnastics.” Getting up at four in the morning to watch Dirk in game 6? That was nothing. The German novelist Thomas Pletzinger stayed up to watch the Mavs game at FC Magnet Bar in Berlin, a popular soccer hangout in the central Mitte neighborhood. He described how the crowd overflowed onto the street. It meant so much to so many people that Dirk was going for the championship, he says. After following him for his entire career, it somehow felt so personal. “There may have been some wet eyes,” he said, as Nowitzki took the Larry O’Brien Trophy. People in the tight-knit basketball community are protective of Dirk, in part because everyone either knows him or thinks they know him. Each of them has his own Nowitzki story — played with him, played against him, coached him, or roomed with him at a camp. The Six Degrees of Kevin Bacon game was fun for the surprises, linking classics like “A Few Good Men” to B movies like “Wild Things.” Degrees of Dirk in the German basketball scene sometimes take two degrees, but usually just one. It’s not exactly suspenseful. Pletzinger, whose debut novel was a big success, made the unconventional choice of following Alba for the entire season to write a book about the Berlin squad. We met up in Bamberg for coffee before the game with Alba’s assistant coach Konstantin Lwowsky. Lwowsky seemed skeptical that Nowitzki’s success would change the position of basketball in Germany. Lwowsky recalled the boom that followed the Dream Team in 1992. Germany hosted and won the European Championships in 1993 and in that same year had an NBA All-Star in Detlef Schrempf. Corporate-sponsored street-ball tournaments suddenly popped up around the country and Lwowsky made a living taking a hoop to Dresden in the former East Germany not long after the Berlin Wall fell, giving away Reebok merchandise to those who hit shots. That proved to be a bubble. The sport has never quite been able to break into the mainstream since. Nowitzki’s own father admitted that he was sorry his son was not going to play handball. Schrempf, with his Ivan Drago crewcut, is now just a pop-culture reference on “Parks and Recreation” and the name of a great Band of Horses song. As foretold by number 666, the acrimony directed at Sven Schultze is overwhelming. Venomous chants of “Schultze raus! Schultze raus!” cascade down from the stands every time he steps onto the floor. And Schultze the enforcer is doling out the kind of hard fouls that define playoff basketball on either side of the Atlantic. He’s averaging 2.5 fouls in 11:32 minutes a game, that’s 10.4 fouls per 48 minutes, or fouling out twice with a little extra for good measure, though like in college basketball, European games last 40 minutes. He will turn 33 this summer. Already his hair is graying on the sides but rather than making the 240-pounder look old it somehow makes him seem even tougher — experienced, grizzled and dangerous, And the fans in Bamberg can’t stand him. The whistling, the screaming calls for his ejection, are like nothing I’ve ever heard. It’s not just that he’s playing for another team. It’s also that he’s playing for Berlin. I live there and can never quite remember if it has 3.3 million or 3.4 million people. The difference behind the decimal is greater than the entire population of Bamberg, a city of just over 71,000. 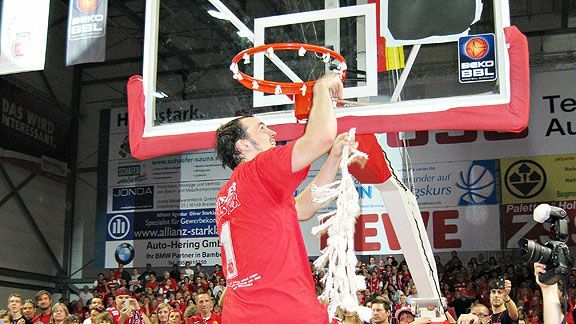 Yet Brose Baskets has 4,300 season ticketholders in Bamberg. The team has 180 different sponsors.] One of the team songs goes, “Bamberger Bauern,” or “Peasants from Bamberg,” to the tune of “Guantanamera.” Schell, the drummer, explains that it’s an insult the Berliners directed at them, “and we claimed it as our own.” They want a title so badly, but they want it all the more because they are playing against Berlin. I sit there, listening to the fans screaming themselves hoarse with “Schultze raus,” and ask myself what Nowitzki would have to do to earn this kind of antipathy. The two players are almost exactly the same age. Nowitzki was born on June 19 and Schultze on July 11, both in 1978. Each has played over 100 games for the national team, probably around 50 together. Schultze isn’t sure when they first met, but guesses it was with the junior national squad when they were 14. People familiar with both players compare their work ethics, but Schultze dismisses it, saying Dirk’s workouts far exceed his in duration and intensity. But when I ask him what comes to mind when he thinks of Dirk, he does not bring up the Geschwindner drills, but rather the fact that the lanky forward is “a total clown, always joking.” Schultze remembers how after the team won the silver medal at the 2005 European Championships in Serbia, they were singing and bouncing and horsing around so much on the elevator that it dropped a foot and stalled. Like everyone else, Schultze calls Dirk “bodenständig,” grounded. I ask him what he means by that. He says that you could never tell that Dirk was earning tens of millions of dollars or that he was a big star. Veterans in the German league with international experience can earn anywhere from $300,000 to $700,000. Dirk is pulling down around $20 million in salary alone, not counting endorsements. The Frankenhölle arena DJ is not afraid to play the classics: Van Halen’s “Jump” for the jump ball, “Eye of the Tiger,” and of course “We Will Rock You.” We yell “Charge!” and we do the wave. The cheerleaders build their pyramid to Joan Jett’s “Bad Reputation.” The DJ mixes in the sound of a ringside boxing bell after timeouts and it fits perfectly in a game where players keep hitting the floor, diving for the ball or taking a charge. After the break, one of Barmberg’s guards hits from beyond the arc and they are down by just three points. They get the ball back off a turnover. Just when you think the momentum may be shifting Bamberg’s way, Jenkins steals it and lofts the ball to former University of Oregon starter Bryce Taylor. The Serb Predrag Suput is back on defense as Taylor bears down on him along the baseline. Suput tries to set himself but Taylor, whose father played in the ABA and NBA, just jumps over him. He goes up and up and then dunks it hard with one hand, pirouetting as he hangs on the rim.4 The crowd lets out a collective, “Oh.” No matter how partisan they are, some Bamberg fans cannot help but clap. Taylor seems to ignite after the dunk. He comes back and drives baseline for another basket. Pressing for a steal on defense, he goes down with a twisted ankle. Where before there was acceleration now there is a hitch of hesitation in his step. Yet as the game goes under two minutes, Taylor makes a three-pointer to put the visitors up 64 to 62. The two teams have played all but 1:29 of a five-game series and Alba Berlin has scored 381 points. Brose Baskets Bamberg has scored 380. It does not matter that the game is in a midsized arena in Franconia, at this moment this could be the NBA Finals, it could be the Olympics and I would not care any more or any less who wins. And it feels like Alba will take it. It feels like the humiliation of losing 103 to 52, the comeback season, the maximum number of games played with every one of their playoff series stretched to five games, all this is going to be of significance. They came in showing no fear and they will get their reward, right? Wrong. Three-pointer for Bamberg, huge board after an Alba miss and another three-pointer and with 40 seconds left Bamberg is up by four. Less than a minute went by and suddenly — you can see it on their faces, in their body language as they come out of the timeout — Alba’s season is ending with a loss. The intentional fouls and the desperation three pointers make it seem like a decent margin of victory for Bamberg, with the final score 72 to 65. There is not a person in the arena, however, who doesn’t realize it would have taken one break, one bounce, one tipped pass and the perfect season at home ends in disaster. 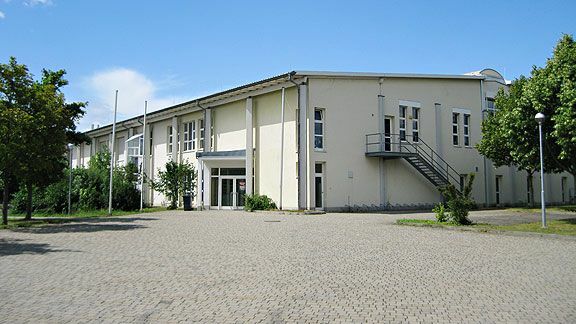 Come August, ahead of the European Championships, the German basketball team will host its summer warm-up tournament on this same floor in Bamberg. Turkey, runners-up to the United States at the worlds, will come to Franconia. So will Greece and Belgium. Dirk Nowitzki will probably be back home just down the road in Würzburg, but is not expected to play. Every fan tells me that he should change his mind. His level of celebrity at home is beginning to grow, as the mainstream audience that does not understand the sport embraces him more and more tightly. The championship brought an outpouring of fawning articles, as well as some strange ones. The newspaper Die Welt even declared that Dirk had “vanquished ghetto basketball.”5 The national sports magazine Sport Bild printed a life-sized photograph of his hand, with a helpful ruler showing the 21 centimeters from the base of his palm to the tip of his middle finger.6 “The Real Hand of God,” read the headline, which kind of summed it up: A soccer reference, to Argentina’s Diego Maradona, to describe a basketball player. Dirk gets treated differently here because he plays the American sport better than the Americans. For a country desperate to be loved abroad, especially by the United States, that is incredibly meaningful. Broadly, if somewhat stereotypically speaking, the French feel superior to Americans. The Italians know the Yanks are no competition when it comes to living the good life. The British are bemused by their overachieving younger sibling across the pond. But the Germans, specifically West Germans like the Franconians, have the kind of complex love-hate relationship with America that comes from millions of foreign soldiers living on your soil over the course of decades. We occupied but also protected, taught but often lectured, served as their role model and guiding principle in democracy then disappointed them from Vietnam to Guantanamo Bay. Germany has its share of misunderstandings with the United States. But in my experience covering the country as a foreign correspondent, there is something leaders here hate much more than when America disagrees with them. It’s when the American government just is not thinking about them at all. If I remember one image from this night in Bamberg it will be the teenagers in yellow jerseys racing alongside the Berlin team bus as it pulls away from the stadium. They are chanting “Vizemeister, vizemeister, hey, hey,” which means “runner-up” but translates more literally and feels more like “vice champion.” Despite the loss those boys are running with joy, running to stay alongside their team. This enthusiasm reminds me what it feels like to be a teenage boy and to have this unwise, unbridled love for school crushes and rock bands and most of all for sports teams. And in America, that’s where the story ends, with those boys in the yellow shirts running and running until the bus pulls away and they are left alone, to realize that the team is the team and they are just fans. But in Bamberg this Saturday night the bus pulls up at the far end of the parking lot and comes to a stop in front of a white tent with people serving food and drinks. The hundreds of fans who traveled on chartered buses with the team are being treated to free beer in plastic cups and free sausages with mustard or ketchup. The players get out of the bus and they join them for photos, for conversation, for drinks. This is so far beyond my understanding of how athletes interact with fans I stand there in stunned silence. The fans hand Bryce Taylor — whose ankle must be killing him now that the adrenaline has worn off and its gone cold in the chilly night — their megaphone for leading chants. They teach him to say, “I love you all,” in German. He cracks up laughing several times but when he finally gets it right the crowd erupts in cheers. Everyone is drinking beer on the gravel of the parking lot and the empty plastic cups are crunching underfoot. LeBron James broke the ultimate taboo when he in essence called the fans rooting against him losers after Game 6. It was a mistake that was subtler than the Decision but could prove more damaging to his standing in the long run. His own fans know they aren’t cool or winners in life just because they happen to root for Miami. And they sure as hell know he won’t stay there if he has a better offer. Dirk Nowitzki gets all this credit for acting like a decent and modest guy in the world of American basketball, when the fact is that he’s German and over here you aren’t allowed to act like you’re that much better than everyone else. You lose the title and then you have a sausage with your fans to thank them for coming to a place called Hell to get your back. And they have it. They keep singing for Schultze, the player who absorbed so much abuse from his hometown crowd tonight. They’ve made up a song, with a tune a little like “Oh my Darling, Clementine,” in which he pops Suput the Serb in the mouth. “Der Sven macht dich kaput!” they shout with glee. “Sven breaks you!” but somehow it sounds light-hearted and fun. He signs the back of an older woman’s jersey. “Hey, make it legible this time,” a fan yells at him and this big, grizzled, slightly frightening guy laughs like it was one of his best friends busting his chops. When the team finally gets onto the bus, the fans have come up with another chant about Schultze. “Schultze drives the bus,” they cry. “Schultze drives the bus.” It makes no sense on the face of things, as there’s a driver, but I get it. He’s our hero. He’s our guy. He can do anything. They aren’t losers, our Julius, our Bryce, our Sven, our Alba Berlin. They’re the vice champions of German basketball.